Synopsis: In this darkly comic drama, a mother personally challenges the local authorities to solve her daughter’s murder, when they fail to catch the culprit. Playwright Martin McDonagh has been making quite a name for himself in Hollywood. He burst onto the scene in 2008 with In Bruges and continued his success with 2012’s Seven Psychopaths. Now, he’s back with his best work yet, the masterful Three Billboards Outside Ebbing, Missouri. Three Billboards Outside Ebbing, Missouri is about a woman named Mildred Hayes (Frances McDormand from Fargo and Almost Famous) whose daughter was sexually assaulted and murdered in the town of Ebbing, Missouri. Frustrated by the lack of progress on the case, Mildred rents three dilapidated billboards on an isolated road outside of town and puts the messages “Raped While Dying,” “And Still No Arrests,” and “How Come, Chief Willoughby?” up on them. The billboards cause quite a stir in the usually quiet little burgh, and while the named Chief Willoughby (The Edge of Seventeen‘s Woody Harrelson) is inspired to re-open the case, his deputy, Dixon (Sam Rockwell from Poltergeist and Laggies), takes the public call-out personally and decides to make life miserable for Mildred. Mildred is no easy victim, however, and she will stop at nothing to get the police in Ebbing, Missouri to stand up and do their jobs. Although it was written and directed by Martin McDonagh, Three Billboards Outside Ebbing, Missouri feels very much like a lost Coen Brothers film, and not just because it features Frances McDormand in the lead role. It is the very definition of a black comedy, finding humor in the most terrible of situations without making light of them. It is also full of jaw-dropping surprise after jaw-dropping surprise, so that the audience has no idea where the movie is going, but literally can’t wait to get there. It’s part mystery with no solution and part crime drama with no reasoning, but it’s all pure entertainment. The world that McDonagh builds in Three Billboards Outside Ebbing, Missouri is based in reality, but has enough colorful, memorable characters and sketches of the surreal to give the movie a definite “Twin Peaks” vibe. There is also zero political correctness in the film, with a proliferation of N-words and R-words, and even a bunch of M-words (Peter Dinklage from “Game of Thrones” plays the town M-word, after all). So be prepared; McDonagh has a great ear for dialogue, but in this case, that means including enough crude language and offensive remarks to make even Quentin Tarantino blush at times. But Three Billboards Outside Ebbing, Missouri isn’t all racial insensitivity. The billboards themselves are thinly veiled symbols of hope, being vandalized and destroyed by the haters, only to be repaired and rebuilt by the optimistic. The movie calls attention to failings of the justice system, but it also demonstrates how one person’s “peaceful” protest can have demonstrable effects on society (peaceful is in quotes because, well, see the movie). Although, that demonstrable effect is not always the desired one in the universe of Three Billboards Outside Ebbing, Missouri. Overall, making movies allows Martin McDonagh to do things that he can’t do in the world of live theater, and he takes full advantage of that fact. 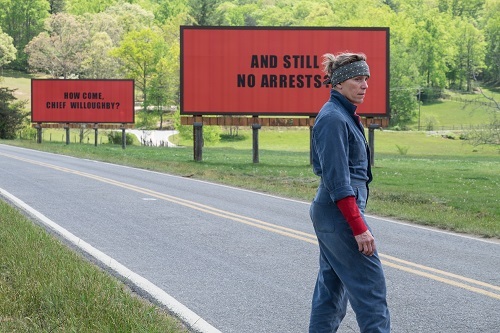 McDonagh unapologetically does things like burn down buildings or throw people out of second story windows, but never makes Three Billboards Outside Ebbing, Missouri seem like an exploitive action film. It’s a tense, twist-a-minute suspense tale with just enough dark humor to keep it from getting to heavy. And that recipe makes it one of the best movies of the year. 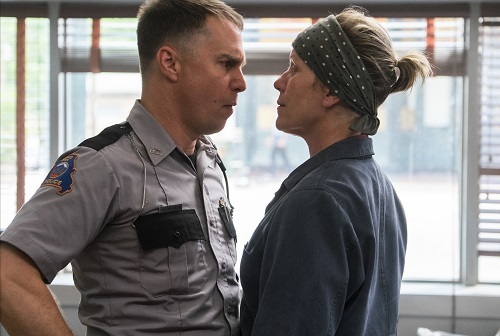 Martin McDonagh wrote the roles of Mildred and Dixon with Frances McDormand and Sam Rockwell in mind, so it’s no wonder why both actors seem so natural and effortless in their respective parts. Still, the different types of anger and frustration that are demonstrated by the pair, both towards each other and towards other characters, take turns being subtle and overstated. Rockwell’s character is the more cartoonish, him playing the racist-cop-with-a-chip-on-his-shoulder stereotype to perfection, while McDormand’s rough-and-tough, no B.S. mother is spot-on. Both McDormand and Rockwell sell the hell out of their roles. And then there’s Woody Harrelson. Although the character of Chief Willoughby does not seem like a very big stretch (it almost seems as we may have seen this Woody before in, say maybe, “True Detective”), Harrelson does bring his best to the part, playing the middle ground for most of the movie, loyal to his fellow cop Dixon yet sympathetic to Mildred’s desperate cause. The support cast is stellar, too, including Lucas Hedges (Manchester by the Sea, Lady Bird), Caleb Landry Jones (Get Out), John Hawkes (The Sessions), Samara Weaving (Mayhem), and, as mentioned earlier, Peter Dinklage. Martin McDonagh could not have landed a better ensemble cast to bring Three Billboards Outside Ebbing, Missouri to life on the screen.